Store Van offers outfitting solutions for Hyundai H350 vans. Flooring and panelling, interior lining for cargo area protection, roof racks and ladder racks, accessories, load safety systems and much more. Contact us for a free quotation. A highly successful debut. 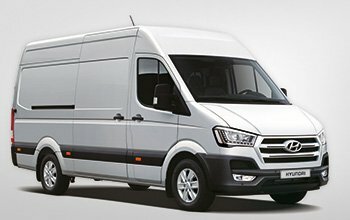 A recent debut in the commercial vehicle market: designed for the Italian and European marketplaces, Hyundai H350 is the first range of vehicles by the Korean manufacturer for the “professional transport” segment. Available in the van, cab and minibus body designs, and in the short and long wheelbase versions, the Hyundai H350 stands out for its comfort, versatility, efficiency and excellent load capacity. Attending as a partner outfitter the official launch in Milan, back in September 2015, Store Van soon became familiar with the main qualities and assets of the new VCL, appreciating its strengths and the generous sizing of the cargo area. So, when, shortly afterwards, a request to design a Store Van mobile workshop for industrial electrical systems on a Hyundai H350 L2 arrived, the design process turned out to be fast and highly effective.